The Institute of Electrical and Electronics Engineers (IEEE) is currently writing the 802.3bt standard which will double the amount of power delivered to end devices. The current 25.5 W will increase to approximately 71 W, which is an increase of a factor of approximately 3. 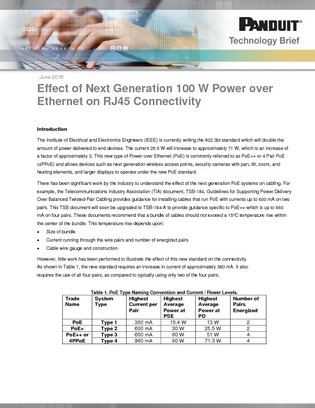 This resource discusses adding power to Ethernet cabling and explains the effect the new 802.3bt standard will have on connectivity. Access now to learn how Panduit’s physical network cabling is capable of improving and changing enterprise operations.